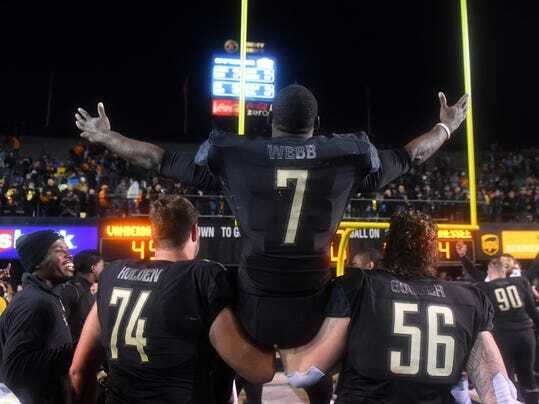 Just when it looked like Shreveport’s Camping World Independence Bowl would be forced to enlist a free agent, Vanderbilt came to the rescue. The Commodores’ sizable upset victory against Tennessee on Saturday helped the Southeastern Conference secure enough bowl-eligible teams to fulfill its obligation to the Dec. 26 game at Independence Stadium. Now, I-Bowl officials will wait to see how the selection process shakes down in both the SEC and ACC. The next several days will be nerve-racking and exciting. The Independence Bowl has the ninth SEC selection after the College Football Playoff bowl system (two semifinal bowls, four access bowls). The SEC wound up with 11 automatic qualifiers (at least six wins) and will get just two schools (Alabama and either Florida or Auburn) in the CFP system. Therefore, the I-Bowl is looking at the final bowl-eligible team.